The diagram above shows the t-rail portion of the layout. 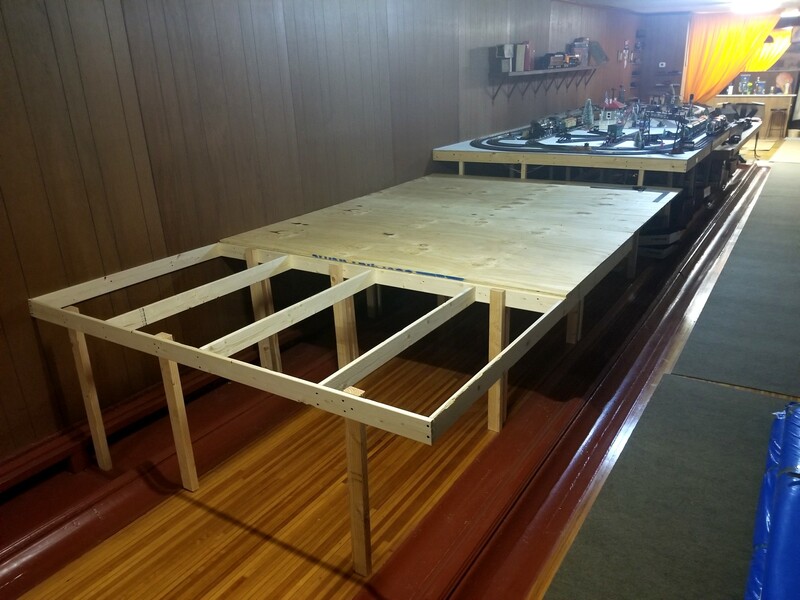 The main board is 33' x 7½'. 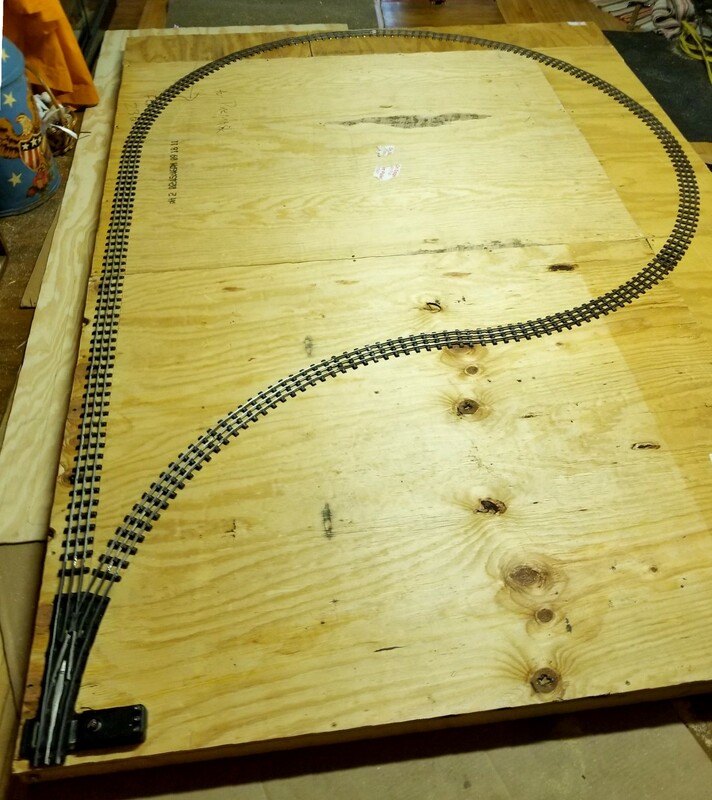 Track in black is the loop and yards on the main level. 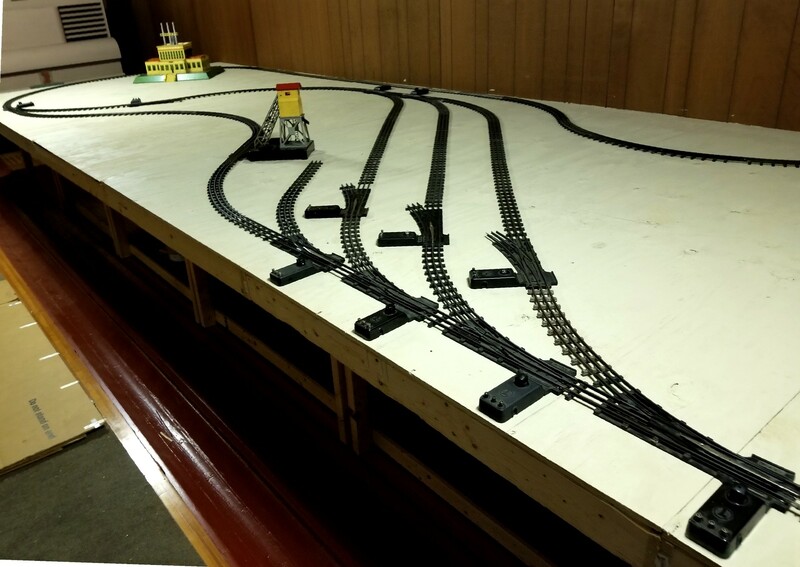 Track in green is a t-rail dogbone. It begins underneath the existing SG layout, emerges at zero elevation and then climbs a 3% grade, looping once around the mountain before disappearing to the upper reversing loop (inside the mountain). Higher up the mountain (indicated in dotted track) is the Lionel OO dogbone. Both reversing loops are hidden inside the mountain, so you'll only see two levels of the train looping up the top of the mountain. 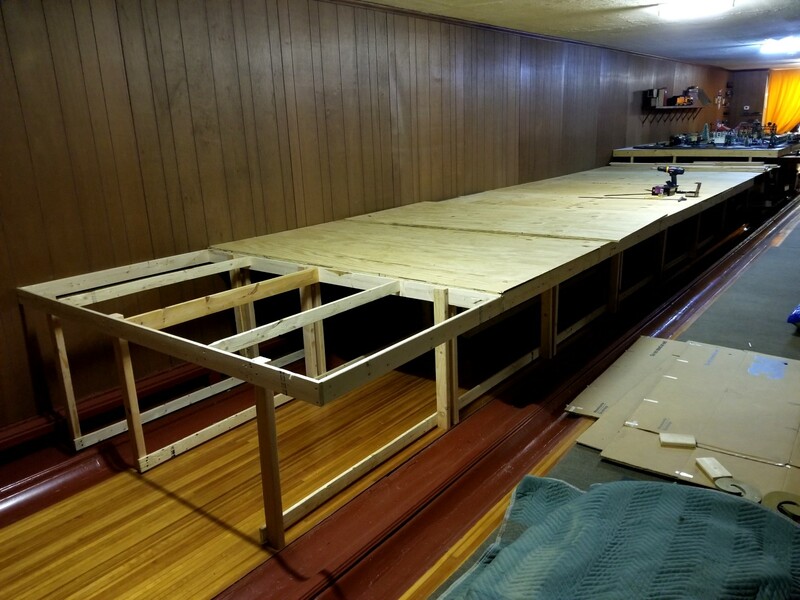 At the end of day 4, about 45 running feet of track. We finally quit at 1am when we ran out of fishplates. It's not a lot - but at least it's a start. 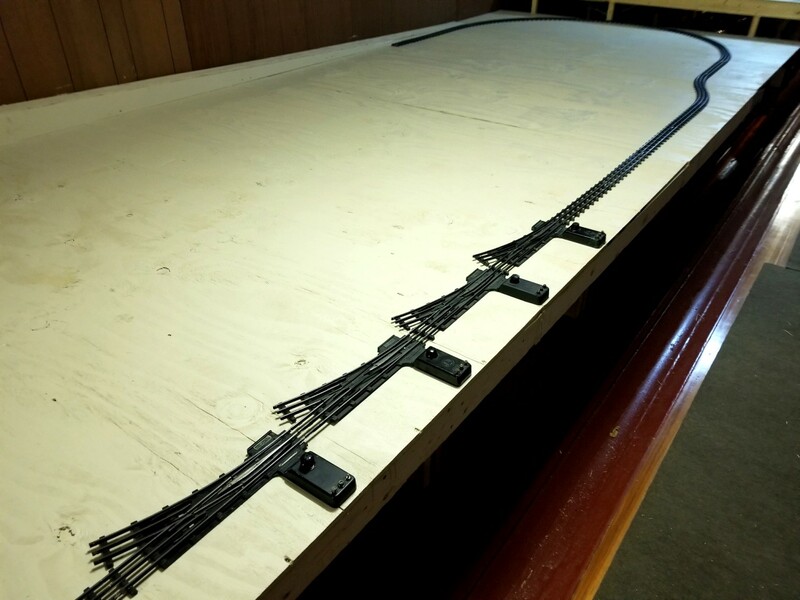 And FYI, bolting those tiny fishplates onto the track with even tinier nuts & bolts is slow goin'. 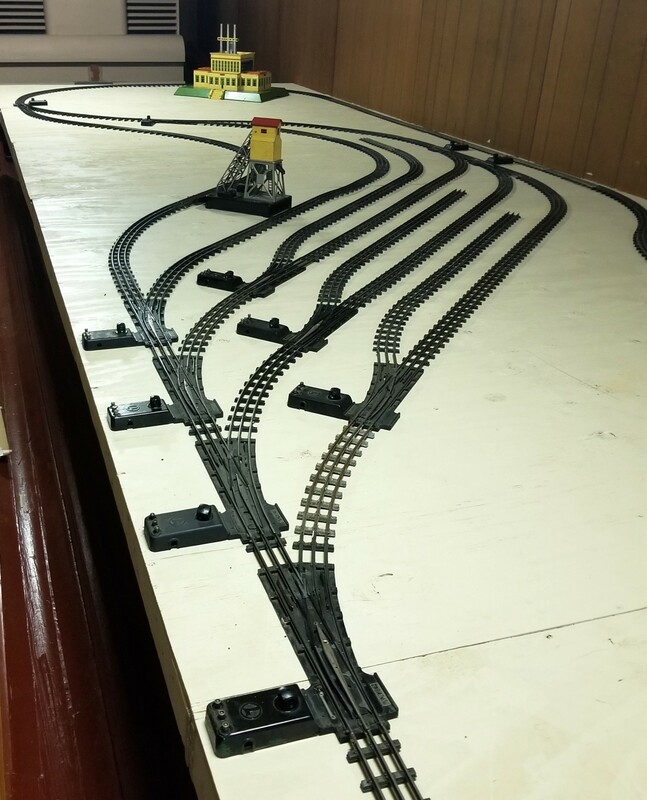 And of course, every 75 year-old track section had to have old hardware removed and the conducting areas wire-wheeled clean; turnouts tested and oiled... Well you get the idea. It wasn't exactly like snapping fasttrak together. But it will be WAY cool if/when I ever get it done. Yes, this is how I spent Christmas day. Then the husband (kindly) bolted on fishplates all day the 27th. This time we ran out of nuts & bolts. 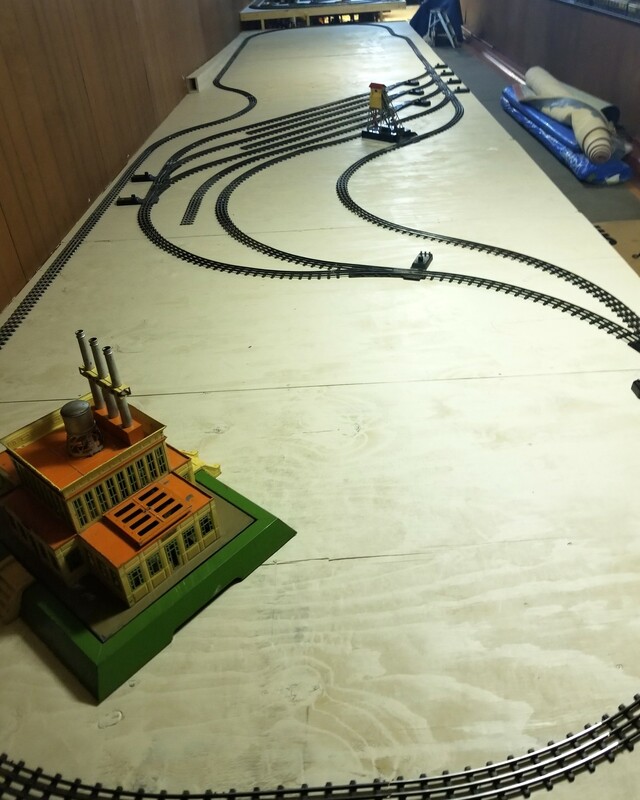 Below left, you can see just how much clearance there is for the "hidden" loop under the SG layout. 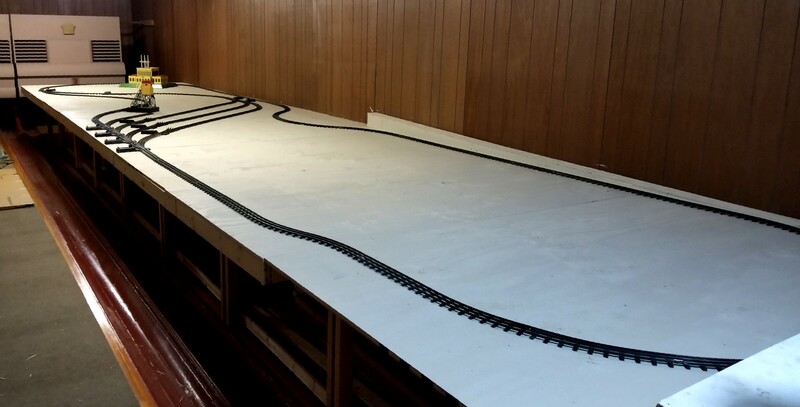 No, it's too dark under there to see the track - but it's there. 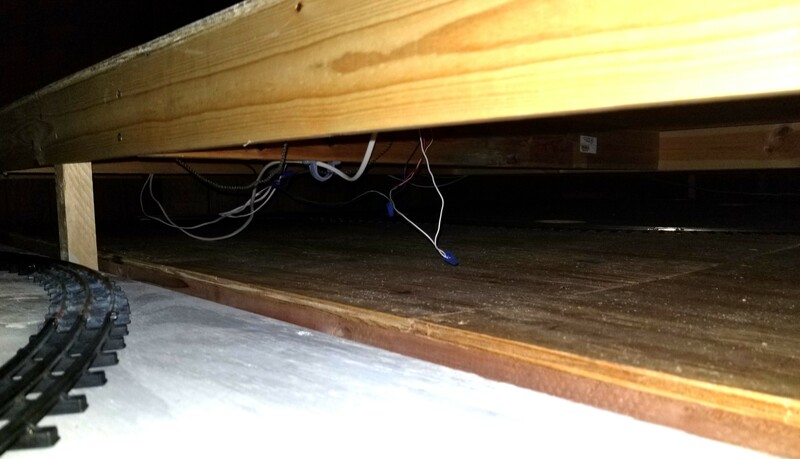 Laying it in place would have been... iffy? 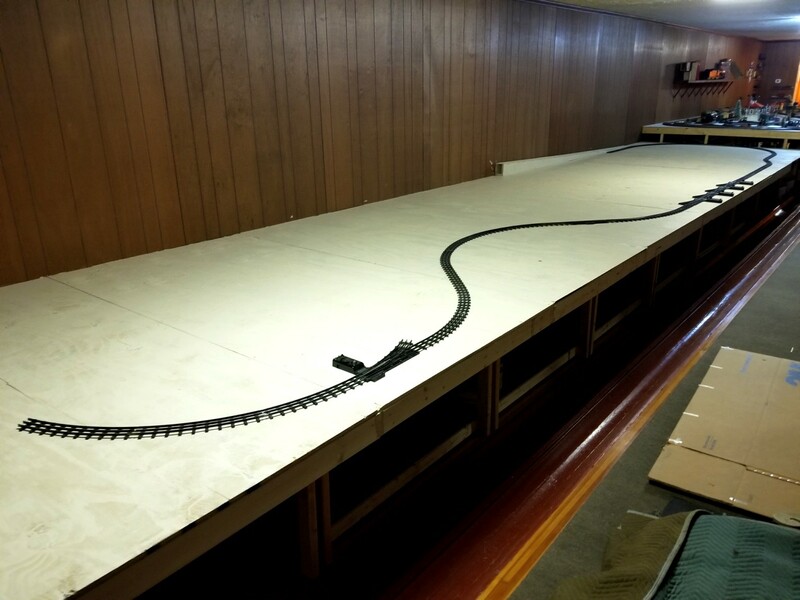 Below right is track laid on the first section of grade. 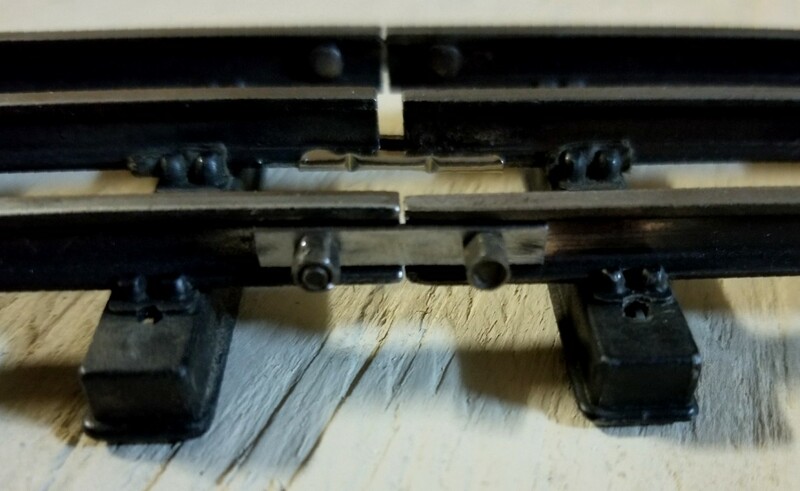 This dogbone and grade section are all actually Marklin t-rail -- which I found (to my surprise) slightly pre-dates Lionel t-rail. Who knew? They're almost identical. I wonder where Joshua got his idea??? On the last day -- as usual -- I ran out of something: T-rail straighs this time. 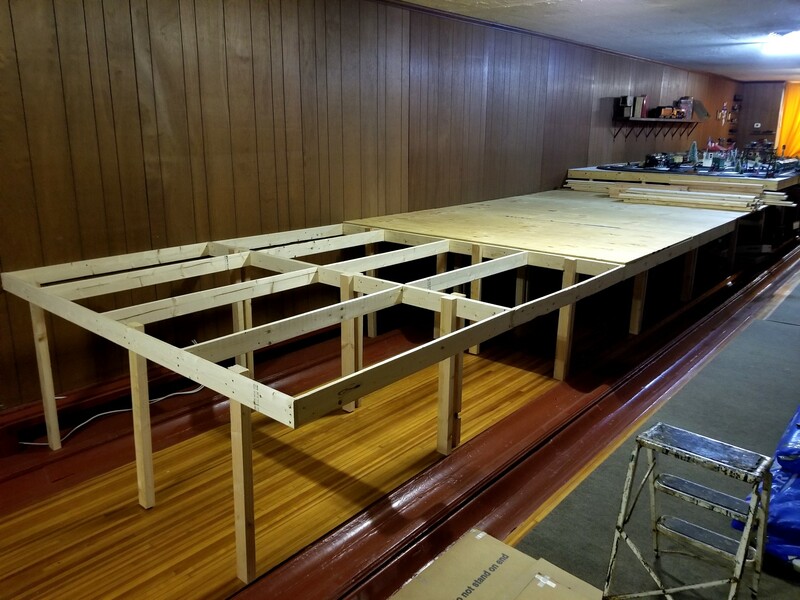 So I decided to start the control area. 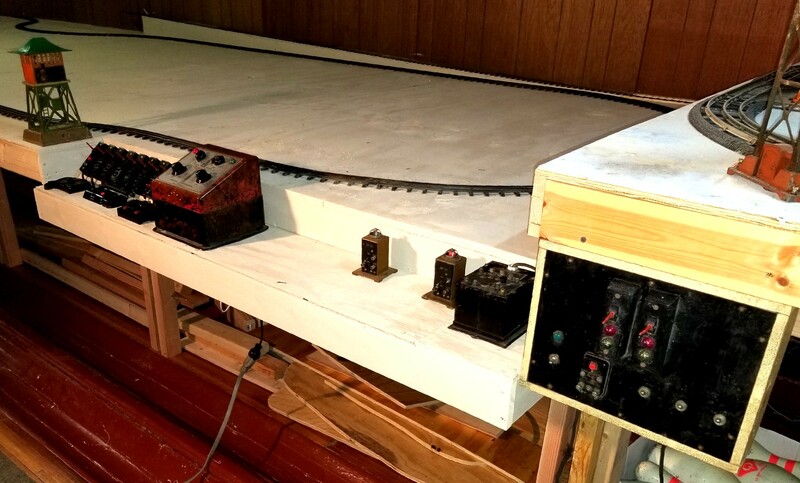 The "black box" on the far right is a home built, prewar control panel I picked up at York for 15 bucks. I'm not sure what it's going to control yet... But I like odd, ancient relics like that. 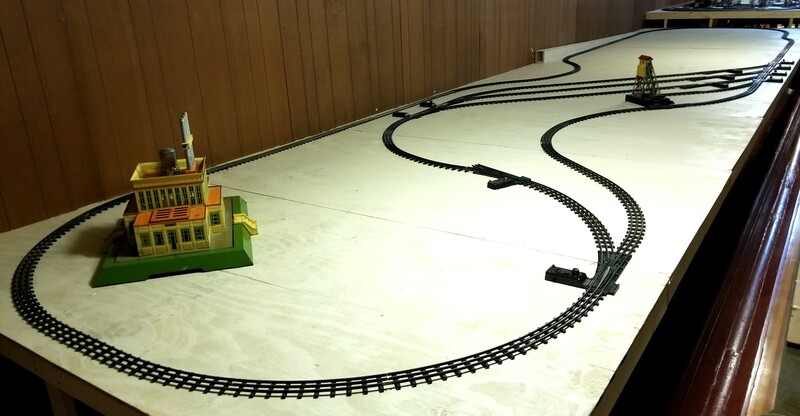 If you visit the "Layout Videos" page, and click "T-Rail Test," you can see the first test run of my BEEP engine around the main loop. OK, not truly exciting cinema... unless you'd just laid all of it. But it pretty much flies around the whole thing -- with just one power feed. Yes, it's a pain in the whatever to lay, but I didn't see any voltage drop at all. 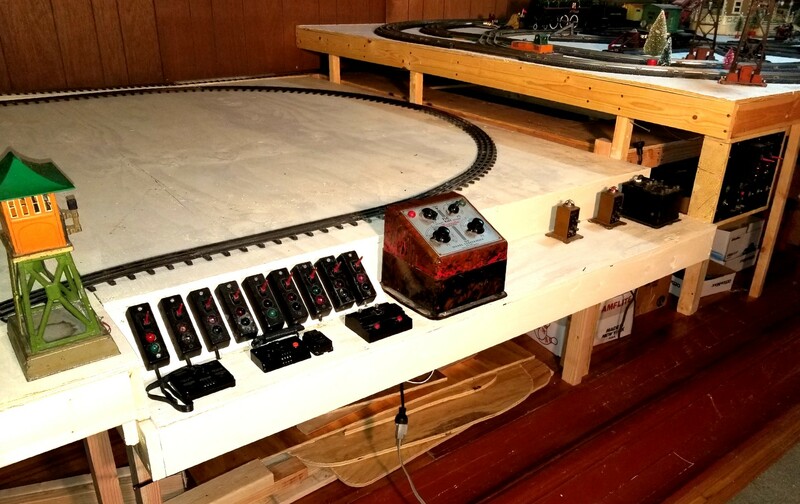 Score one for the obsolete track system! 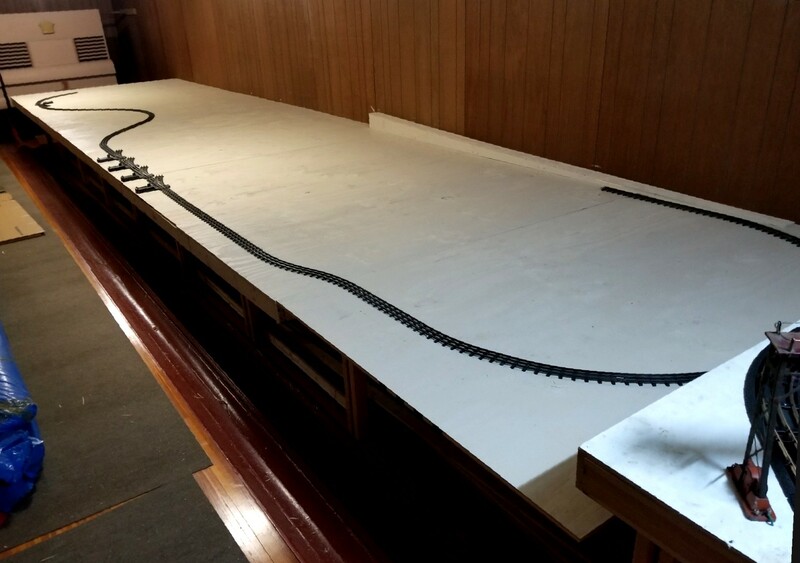 Once the T-Rail and OO sections are complete, A Gauge-1 loop or two goes in the large empty section in the center of the layout. And then the Leland-Detriot monorail goes above the whole thing. But those are projets for aother day (year... decade...). Ah well, it's off to Greenberg and York in search of more straight sections. I have plenty of time. It doesn't look like I'm back in town for more layout work 'till November. Sigh.